Learn Collegiate Shag - it’s funny, it’s goofy and we are sure you’ll love it! In this class you will learn the basics of Collegiate Shag - a partner dance that originated in the 1930’s and has a history similar to other jazz and swing era dances. The dance is known for its hopping basic step and high energy footwork to up-tempo swing and pre-swing jazz music (185-220+ beats per minute). In Shag 1 we focus on two types of basics. First is the face-to-face basic in both closed and open connection. Next we also work on our side-by-side basic both on the spot and with travelling patterns. Within those basics we will teach you different turns and spins in a way so you are a ready for a social dancefloor already after this first round. You don’t need any prior dance experience to join this class. But if you have danced swing or another dance before, then that’s of course an advantage. Shag 2 is a continuation from the Shag 1 course and we are ready to explore more of what this dance can bring us. We will keep working on the basic moves and techniques and we will introduce new types of footwork as well: double kick basic and "breaks" to hit those special moments in the music. In every round we will come along figures and variations that will make you work on both the styling and functionality of different kind of footwork so you will feel comfortable changing between plain basic, single-kick basic, double kick basic, smooth basic and more. At the end of this level you'll be able to enter a social dance floor with cool moves like ‘sliding doors’, ‘Shag-dips’, Shag-outs (Collegiate Shag's interpretation of swing outs) and Shag Sailor step. You need to complete Collegiate Shag 1 course to be able to join this class. If you have danced Shag in another school before, you need to have at least 2 months of experience to be able to join this class. And please have a dialogue with the teachers if you would like to join to make sure to end in the best suitable level. Shag 3 is a continuation of Shag 2 and will be a level where lead/follow-technique and new types of footwork will be combined with more complex figures and combinations/spicing up of known figures and moves. You already use and understand footwork variations and different types of basics as part of your styling and as a functionality in your dancing. With other words – both are no longer a struggle but a thrill. Expect to be both challenged with faster tempo and new moves while you have fun and you’ll find your Shag technique to develop along the way. You need to complete minimum 2 rounds of Collegiate Shag 2 course to be able to join this class and if you would like to advance for this level please have a dialogue with the teachers for guidance on your choice. If you have danced Shag in another school before, you need to have at least 6 months of experience to be able to join this class. And please have a dialogue with the teachers if you would like to join to make sure to end in the best suitable level. Shag 4 is the highest level and is thought as a spicy add-on for advanced Shag-dancers while also doing Shag 3 or if you just want to dig deep into a certain theme changing from round to round. Themes like fancy figures, Shag-vocabulary expansion, Show and competition or an ambitious focus on technique. The theme of Shag 4 this round is: "Technical deep dive & feedback". You need to complete minimum 3 rounds of Collegiate Shag 3 course to be able to join this class and if you would like to advance for this level please have a dialogue with the teachers for guidance on your choice. If you have danced Shag in another school before, you need to have at least 1 year of experience to be able to join this class. And please have a dialogue with the teachers if you would like to join to make sure to end in the best suitable level. Shag 1 (Beginners Course) is minimum 1 round (7 weeks) and then you move to the next level. On Shag 1 there are several courses with the same material, just on different days. Choose the one that fits your schedule best. Shag 2 is minimum 2 rounds (14 weeks) and then you move to the next level after a dialogue with the teachers. Shag 3 is minimum 3 rounds (21 weeks) and then you move to the next level after a dialogue with the teachers or continue drilling techniques through a variety of figures and moves. Feel like you need more repetition? You can always take the same level again and move on when you feel ready. And never hesitate to include the teachers in your thoughts. If you had a break in taking classes for 3 months or more, you must repeat your last level, to ensure that you can follow the classes. 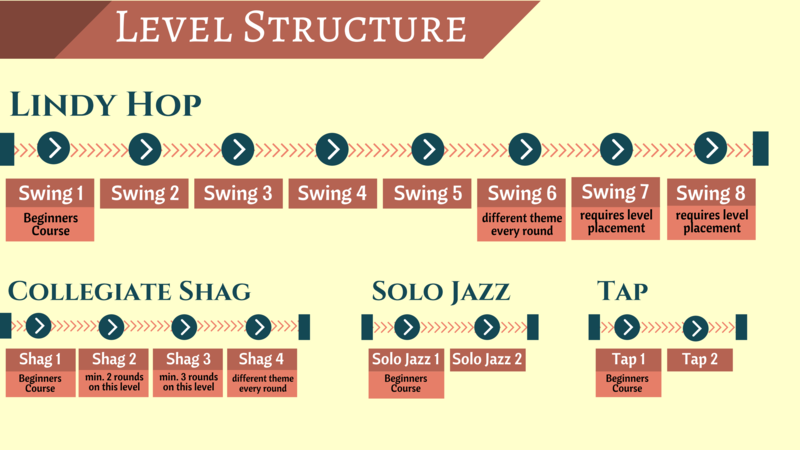 We have collected some of our favorite swing songs, which are good for practicing new moves, and put them together in a Spotify and Youtube playlists. The songs are ordered from slow to fast tempo. Come and practice moves from your class during Open Practice. You might want to bring a partner to dance with, but otherwise the dancefloor is open, and the music is playing, so come and dance! 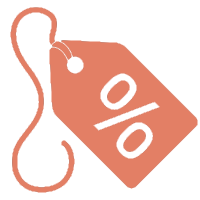 If you sign up for two or more courses in the same round you will receive a 10% discount on all your courses!